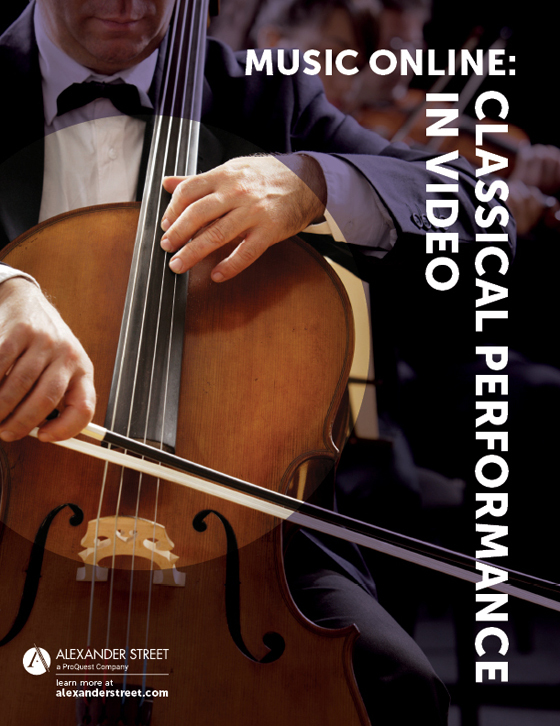 Music Online: Classical Performance in Video is the largest and most comprehensive video resource for the study of classical music. Users experience classical music through 1,600 performances, including 200 full operas and 75 dance titles, as well as masterclasses, documentaries, scores, and interviews. Video as a learning tool provides a rich experience for music students. All patrons use the multimedia tools in this collection to research, analyze, learn, and enjoy the classical music genre. Performance, musicology, conducting, theory, and composition faculty and students all benefit from this unique resource. Singers can watch a master class led by Teresa Berganza and see how she implements her own technique in Luisa Fernanda. Conducting students can analyze how Claudio Abbado’s conducting style changes from La Mer to Tannhäuser, or compare his interpretation of Beethoven’s Symphony No. 9 to Kurt Masur, Leonard Bernstein, and Daniel Barenboim. Theorists and musicologists will find historic recordings an essential visual component to the works of John Cage as performed by the Merce Cunningham Dance Company.